Recently, the Harrington's brought to the attention of Daejeon Diners the fabulous Burger find: Ms. Jin's Hamburgers. However, some readers may not often find themselves in Gung-dong, or may be craving a tour of burger shops. If you just so happen to love exploring the world of Hamburgers, then we at The Harrington Times bring you yet another stellar find to satisfy the craving for a delicious burger: Play Burger. 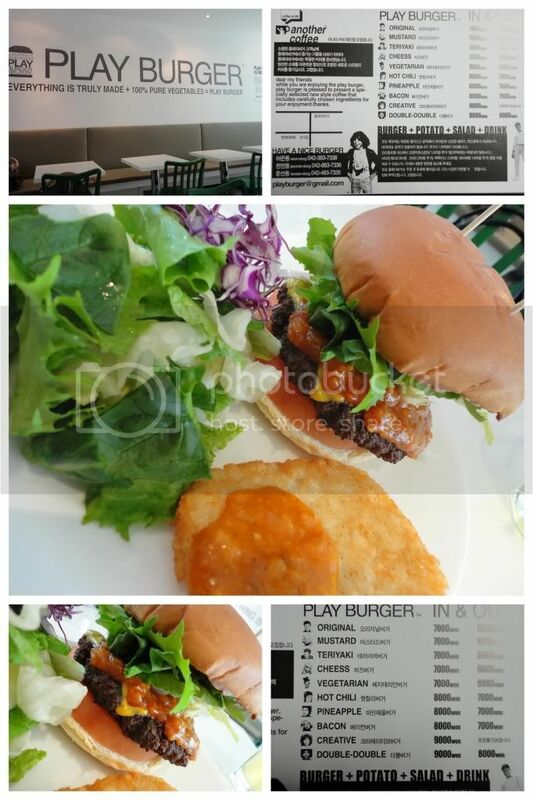 Unlike Ms. Jin's, Play Burger is a franchise and may therefore be discovered in more than one nook and cranny of Daejeon and Korea as a whole. Nonetheless, should you spot this gem of a shop just at the time a burger craving hits you will not be disappointed! For an impressively fair price of between 7,000 and 9,000 Won a diner can enjoy a '100% Pure' burger + Fried Hash Brown Potato + Green Salad + Fountain Soda - that is a STEAL! AND, it's delicious! Getting There: In Daejeon, a Play Burger has been spotted across the way from E-Mart in Dunsan as well as in Gung-dong on the opposite side of the river from Home Plus.